Useful Information for Guitar Players of all levels and ages. Many thanks to Travis Morgan for this excellent image. More on the "Three Chord Theory"
The Three Chord Theory Demystified: It is interesting to note that almost all songs have three chords that can be used to play the song. All you have to know is what key the song is composed in. Some examples would be B, F and G (key of B); or G, B, and D (key of G). This concept is the basic foundation of the "Three Chord Theory". One major component of the theory is to assign a Roman numeral to each note in a particular key/scale. If the key of the song you wanted to play is C, then the eight note musical scale for that key would be C, D, E, F, G, A, B, C. No sharps, no flats. The first C in the scale gets the Roman numeral I (1) attached to it. The D is II (2). E is III (3), and so on up to the last C which is a root note (one octave higher or lower) and receives the same designation as the starting root note. In the image below you can see that there are seven notes in the scale. The scale contains eight tones because the C is played at the start and end of the scale. Learning to number a scale is a valuable trick to know. For instance, if you wanted to find the I, IV and V chords in the key of G all you have to do is start with G in the I position and continue to assign the correct roman numeral to the remaining letters in the scale. G (root) would be 1, A is 2, B is 3, C is 4, D is 5, E is 6, F# is 7 and the G (1) is back to the root note one octave higher than you started with. The I, IV an V chords for the G scale are G, C and D. It is a very useful tool to be able to figure out the I, IV and V chords in a songs key or scale. Roman Numerals and The Three Chord Theory: The image above shows the essence of the Three Chord Theory represented in Roman numerals. The notes/chords found in the I, IV, V positions make up the primary notes/chords in a major key. That's 1, 4, and 5 in that order. Speaking in chords, in the key of C the Three Chord Theory would have you use the first (I) chord in the scale which is C (the root note or chord), the fourth (IV) chord which is F and the fifth (V) chord which is G. That's how easy it is to apply the Three Chord Theory to a major scale in any key. In a 4/4 song it's easy to add the C you started with onto the end of the progression. So the progression would be: C, F, G and back to C (the same C chord you started with). It sounds great. Try strumming the chord progression. If you don't already know the chords, you can find them at our Guitar Chord Generator page. Use four beats for each chord. The "one" beat should be on a down strum. It should go something like this, C;↓, two↑, three↓, four↑; F↓, two↑, three↓, four↑; G↓, two↑, three↓, four↑; C↓, two↑, three↓, four↑. Repeat from the first C. Start slowly and be deliberate. Try to strum with consistent tempo and rhythm. Strive to "sound" the chords clearly with no string buzz or "slapping" of the strings on the fretboard. At first emphasize the one and three beats in a progression. Don't forget to practice strumming on both the down strum and the up strum. Make sure to tap your foot to the beat. It's very important to engage your natural metronome (foot) every time you play. Once you master the progression at a slow tempo, try increasing the tempo. Figure out the I, Iv and V chords for other scales and practice strumming those chords using the technique from above. For something more entertaining try emphasizing different beats. Start by sounding the "one" beat with more emphasis than beats 2, 3 and 4. After you get that down, try making the "two" beat louder than the other beats. Then move the emphasis to the "three" beat and so on. You can do two beats per measure also. Like the one and three beats or the two and four beats or whatever sounds good to you. The important thing is to have fun with it. An astounding number of songs are built on the I, IV and V chord progression in the key of C. The Three Chord Theory may very well be the back bone of music. If you know the notes in a particular key you can use the chart above to figure out the I, IV and V chords for that key. Just replace the letters in the chart above with the letter note names for your new key. Always start the Root Note/Chord with the first Roman numeral. At first practice applying the major scale step pattern to several different natural notes on the sixth or fifth strings of the guitar neck. The pattern works on the other strings too, but when the pattern takes you from the third string to the second string (or vice versa) you encounter the "tuning trap". It has to do with how the guitar string tones change from the G string to the B string (or vice versa). What you have to do is figure out how to find the next note in the scale, on the correct string, using the major scale step pattern. For now, start with applying the pattern to the sixth and fifth string natural notes. When you're ready for more, research how to extend the pattern to the other strings. Download a blank step pattern and numbering diagram. The image will open on your screen. Once you see the image, right click on it and "save the image". Note where it will be saved to, for ease of finding it again. A brief explanation of sharps and flats. Easily Find Sharps and Flats: Sharps and flats are located between two natural notes*. If you are playing the Blue B on the E(6) string at the seventh (7) fret and need to descend one half tone to B flat, you would move your finger down the fretboard one fret (one half tone) to the sixth (6) fret where the B flat is located. If you are playing the Red A on the E (6) string at the fifth (5) fret and need to ascend one half tone to A sharp, you move your finger up the fretboard one fret (one half tone) to the sixth (6) fret where the A sharp is located. *Exceptions are when a scale incorporates half tones. A good example of this can be found in the C major scale. The tone between the B and C is only a half tone/step. Again the tone between the E and F is only a half tone/step. What if you need to play a C flat or B sharp? Treat it just like you would any other half step/tone note. If you need to play a C flat simply move your finger down the fretboard one tone/fret. You will effectively be playing a B note, but in the structure of the scale and the music score you will be playing a C flat. For a B sharp you would move your finger up the fretboard one tone/fret. Even though you are actually playing a C note, the scale/composition you are playing would notate it as a B sharp. 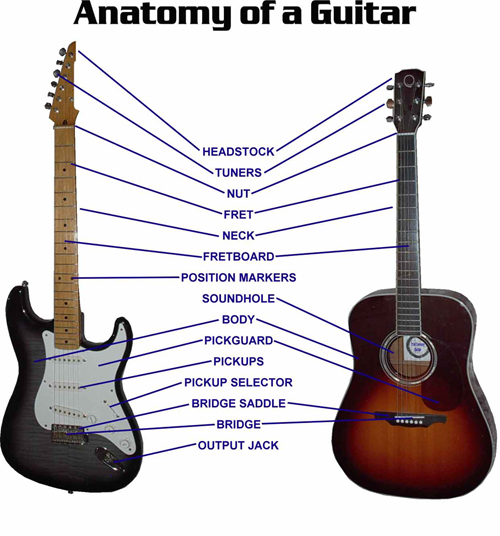 The image above is a great tool for the beginner guitarist. You can easily understand which note to play when you are faced with a half tone flatted or sharped note. Here you will find some basic music theory, everyday music terminology and some extra information courtesy of Don't Fret Productions™. Music Staff: The Staff is five lines with four spaces between the lines. The lines and space correspond with the note names. Both the lines and spaces are counted from the bottom up. A good trick for memorizing the names of the spaces is, they spell FACE from the bottom up. The trick for lines is an old saying that goes, "Every Guitar Body Deserves Finesse", again from the bottom up. With the use of our Don't Fret Note Map™, you will easily learn the location of the notes on your instrument as you learn to memorize the note positions on the music staff. Ledger Lines: These lines extend the music staff so notes that are higher or lower in pitch, than the ones on the staff lines, can be shown. Treble Clef Sign: The treble clef sign shows where the musical piece begins. You will always see the sign at the beginning of a piece of music. Key Signature: The key signature tells you in what key the song is written. Every song is composed in a particular key that corresponds with the "main" or root note of the song. The root note will dictate the chord progressions and scale patterns used in the song. If no key signature is shown, the song is in the key of C major. This example shows the key of D major. Rhythm: Rhythm indicates which notes receive accents and which do not, and contributes to a song's feeling or mood. Rhythmically, a song can be broken down into easily understood segments, called measures, or bars. Measures have a designated number of beats-usually three or four. Listening to a song you want to play is a good way to grasp the rhythm of the song. *A 2/4 signature gets 2 beats per measure (each quarter note receives 1 beat). *A 3/4 signature gets 3 beats per measure (each quarter note receives 1 beat). *A 4/4 signature gets 4 beats per measure (each quarter note receives 1 beat). Combinations of rests and notes must equal the time value of the number of beats in the measure. Timing is everything. Listen to the song you want to play. It will help you tune into the timing, rhythm and feeling of the song. Measures and Bar Lines: Bar lines create measures. A tempo can be broken down into easily understood segments. These segments have a designated number of beats, which comprise a measure. Beats are usually played in groups of three and four. This group of beats is a measure. The time signature tells you how many beats are supposed to be in one measure. Repeat Signs: When you see this sign go back toward the beginning of the piece until you see a similar repeat sign, then play that section again. Rest: A span of time in which there is silence; a notation symbol specifying a silence of some duration. The music notation symbols for a rest are numerous. Common symbols are small rectangles that reside above or below a staff line in the place of a note. Rest symbols represent the same time values as notes, i.e. a rest can have the time value of a whole note, half note, quarter note, eighth note, Etc. Rests are an important component of music. The information provided below is directed to the beginning player and works well with the Don't Fret Note Map™. At first the best way to get results from your guitar practice is to set aside at least 20 minutes per day, at the same time of day, for your study. Once you get in the groove of practicing strive for two twenty minute sessions, one in the morning and one in the evening. Repetition is the key to improvement! As you progress your skills and improve your hand strength, you can easily increase the duration of your practice sessions. Start slowly, let your hand strength develop and avoid progressing too fast. Your ability to remember what you just learned will improve with time and repetition. In the beginning, strive to emphasize beats one and three for the "beginner" songs. Take time to understand how tempo and rhythm are incorporated into a song. Consult a qualified instructor or the internet for more information about tempo and rhythm. Always revisit past lessons and compositions to keep them fresh. Once you've mastered a piece or lesson, consider finding similar but more difficult pieces that will challenge you to become a better player. Start with warm limber hands. Gently stretching your fingers and wrists can help. At first practice sitting down, with the guitar resting on your thigh. Once you can comfortably find the notes and strum or pick the strings, throw a strap over your shoulder and try standing up to play. Don't let the neck of the guitar point down, try to keep it horizontal to the floor or in a slightly upward pointing profile. Make friends with our metronome, it will help you develop good timing. If you are learning a 4/4 song tap out four beats then start on the next (one) beat. If you are learning a 3/4 song, tap out three beats then start on the next (one) beat. Tap your foot in time with the song to help develop your own internal rhythm. This is an important one. You will notice that most serious musicians use this technique. 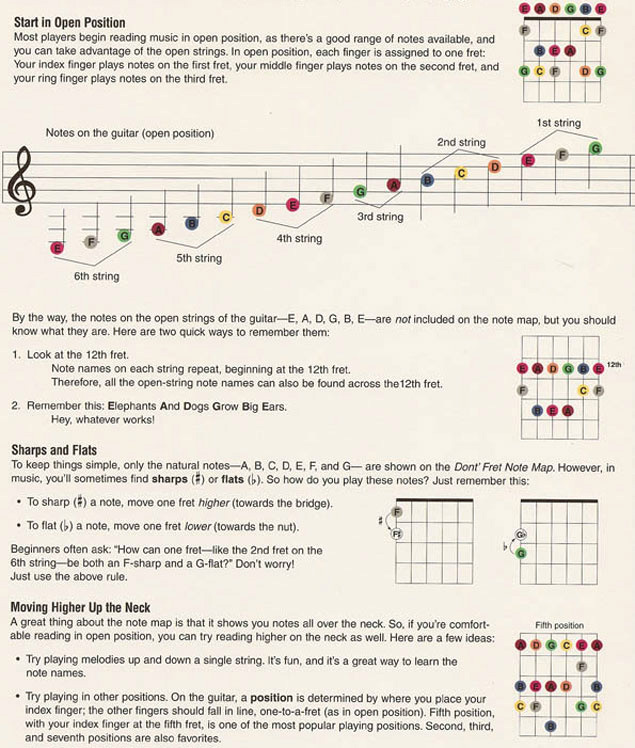 We recommend a healthy dose of our Don't Fret Note Map™ (to help overcome Novice Player Anxiety Syndrome), a good guitar teacher, online guitar teacher or guitar instruction book. If you can get a routine going, same time of day and length of time every day, you will progress quickly. Remember to have fun with your practice sessions and playing. Try to always end your practice sessions with a positive feeling by playing something familiar and fun. Visit our Products Page to see our innovative line of guitar learning aids. Are you looking to further your knowledge of guitar scales? Our Don't Fret Note Map™ can be an invaluable tool. The no-miss road map of the guitar fretboard eliminates Novice Player Anxiety Syndrome. Put one on your fretboard and see how easy it is to learn guitar scales and guitar songs.